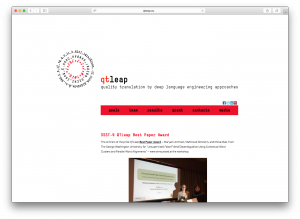 QTLeap – Quality Translation by Deep Language Engineering Approaches is a scientific research project on machine translation. The goal of the project is to research on and deliver an articulated methodology for machine translation that explores deep language engineering approaches in view of breaking the way to translations of higher quality that are opened by a new generation of increasingly sophisticated semantic datasets and by recent advances in deep language processing. The deeper the processing of utterances the less language-specific differences remain between the representation of the meaning of a given utterance and the meaning representation of its translation. Further chances of success can thus be explored by machine translation systems that are based on deeper semantic engineering approaches. This project will deliver both an articulated methodology for quality machine translation that innovatively explores deep language engineering approaches to language technology, and an empirically grounded validation of its technological potential and impact. From a business and societal perspective, this project aims at producing a significant impact for commercial quality machine translation, the industry related to it, and for the European citizens, in general, as the ultimate users and beneficiaries of translation technology in their multilingual living and working environment. For more information please visit qtleap.eu. QTLeap Kickoff Meeting at the University of Lisbon on 5 November 2013. The meeting was attended by all the partners’ representatives. This project has received funding from the European Union’s Seventh Framework Programme for research, technological development and demonstration under grant agreement no. 610516.